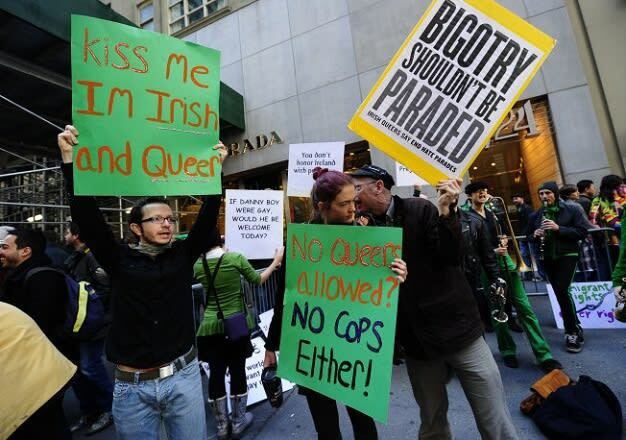 For the very first time, New York City&apos;s St. Patrick&apos;s Day parade will permit an LGBT group to march during the procession. The New York Times reports that the New York City Saint Patrick&apos;s Day Parade Committee issued a statement today announcing that OUT@NBCUniversal will march with a banner at next year&apos;s event. NBC Universal Executive Vice President and Chief Diversity Officer Craig Robinson told the Times that, at the moment, it&apos;s unknown why OUT@NBCUniversal was selected, but they are welcome regardless. "We welcome the parade committee&apos;s decision to accept OUT@NBCUniversal&apos;s application to march and enthusiastically embrace the gesture of inclusion," he said. "Our employees, families and friends look forward to joining in this time-honored celebration of Irish culture and heritage." Spokesman Bill O&apos;Reilly, not to be confused with the other Bill O&apos;Reilly, said that other groups can apply to participate in future marches.